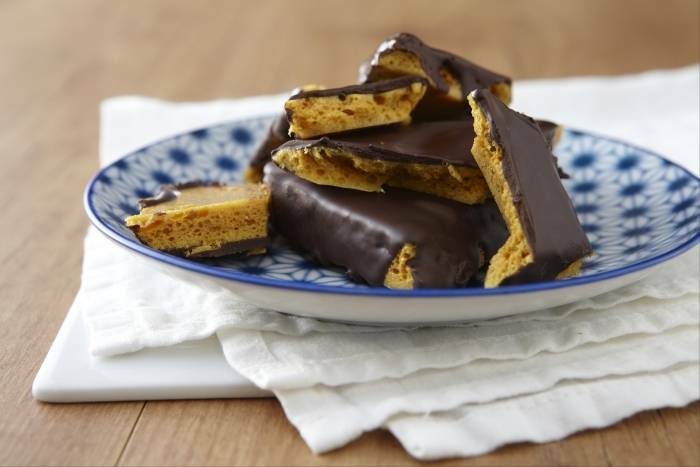 An easy recipe for homemade crunchy honeycomb coated in dark chocolate. Place the sugar and golden syrup in a heavy bottomed pan and mix together off the heat. Once mixed, transfer to a high heat and take to a golden caramel. Remove from the heat and add the bicarbonate of soda. Shake the pan vigorously until the mixture starts to foam. Pour the mixture out on to a non-stick mat and leave to set. Break the chocolate into small pieces and place in a heatproof bowl over a pan of simmering water. Heat gently until the chocolate has melted and is shiny. Once cool and set, break the honeycomb into pieces and then dip each piece into the melted chocolate. Place on a wire cake rack to ensure the honeycomb is evenly coated. Place in the fridge to set.